Sunday’s Super Bowl ushered in the latest iteration of Budweiser Canada’s well-loved Red Light campaign. During the broadcast, the brand ran a 60-second spot introducing the Budweiser Red Zeppelin, a 21-by-7-metre version of the small lights the brand sold as part of a campaign last winter. The “world’s largest goal light” is actually a blimp outfitted with 75,000 LED lights and a 600-watt sound system that will go off when a team scores. Flying as high as 122 metres, the two-storey light will be used during activations for both NHL games and Canadian Olympic hockey games. Conceived by the brand’s agency of record in Canada, Anomaly, the household version of Red Light was first introduced during last year’s Super Bowl and went on to win many awards, including a Silver Lion at Cannes. “We launched last year at the Super Bowl and thought it was an amazing icon of celebrating goals and wanted to continue the story. We figured big goals deserve big celebration, so we said, ‘let’s make it as big as we possibly can. '” said Michaela Charette, brand director of Budweiser in Canada. “We want to make sure we continue to elevate game time and give people an arena experience in their homes,” Charette said, adding that it was a no-brainer to continue its focus on the Red Light for 2014. Why walk away from an idea that gives back to Canadian hockey fans?” she said. 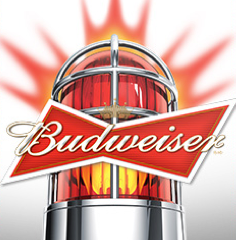 As in 2013, the lights are available via Budweiser’s online store for $149 throughout Feb.
Last October, the brand introduced a third version of the Red Light concept, giving more than 3,000 helmets topped with Red Lights to Calgary Flames fans during a home game against the Washington Capitals. This time around, Budweiser will tour the light across Canada starting Feb. 7 in Ottawa, where it will fly over the Byward Market and along the Ottawa river. Mosaic, Budweiser’s experiential agency, will help put on events showcasing the Red Zeppelin in Toronto, Montreal and Vancouver, with the possibility of more cities to come through June as hockey season continues. Once the Olympics are underway, Budweiser will also host parties for consumers to watch the hockey games at in cities across the country. The Red Zeppelin campaign will be supported by digital marketing, including a minute and a half version video showcasing the making of the light and a series of Facebook cover photos the brand is encouraging consumers to use as their own cover to show their support for Canada’s teams during the Olympics. In addition to TV ads that will air during games through hockey season, Charette said the brand’s media agency, UM, has taken “significant” buy that includes paid media on Facebook, YouTube and Twitter.